The Zhengzhou Metro is a rapid transit network for public transportation in the suburban and urban districts under the municipality of Zhengzhou. The National Development and Reform Commission of China approved of the plans for construction of Lines 1 and 2 back in the year 2009. While the construction of Line 1 started in the same year, the project of Line 2 was taken up a year later. In keeping with the plans, services on Line 1 commenced in the month of December in 2013 while the second line is expected to begin operation in the year 2015. Line 1 of Zhengzhou Metro, running in an east-west direction, covers a total distance of nearly thirty-five kilometers. It starts from close to the New Campus of Zhengzhou University and ends at the region around Muzhuang. The line is divided into two phases, the first of which is entirely underground and covers a distance of twenty-six kilometers. This was the zone that became operational in 2013 and is served by twenty-two stations along the route. Line 2 runs in a north-south direction over a total distance of twenty-seven kilometers. Served by twenty-one stations, it starts from the district of Huiji in Zhengzhou and ends at the region around Zhanmutan. The first phase that is set to be opened in 2015 has a track length of nineteen kilometers with sixteen stations along the way- fourteen of them underground and two at elevated levels. Extension plans are in place for the Zhengzhou Metro network that will take the overall number of lines to six for this public transportation system in China. Map of Zhengzhou Metro showing various lines and stations. 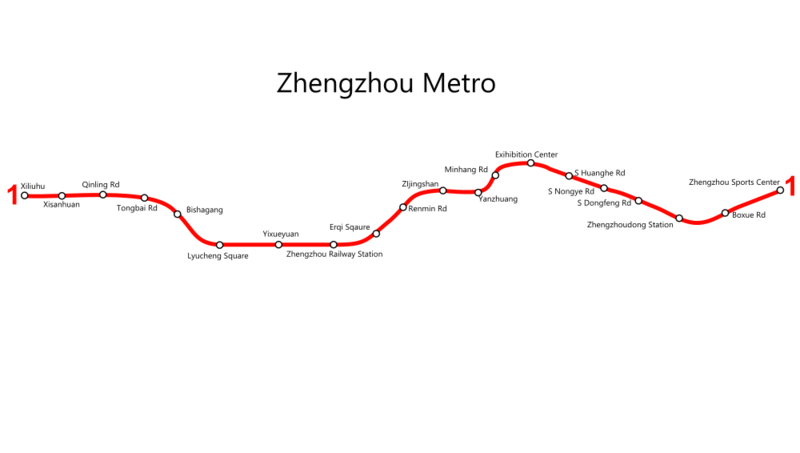 Click on the map to enlarge it or Download Zhengzhou Metro Map in PDF.